This weekend's strip of Prophet Buddy over at Dumm Comics, is a follow up to last weekend's strip. There's one more strip to go for Prophet Buddy month over at Dumm. 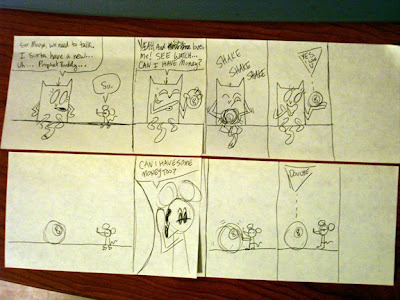 Here are the super roughs of the 8-ball strips I submitted to Dumm for their approval. It can't be over that fast! Oh well... I'll try to seek comfort in seasons 1 and 2. Prophet Buddy is sooooo Dumm!